JAKARTA – PT Honda Prospect Motor (HPM) began sending the made-in-Indonesia All New Honda Brio to the export market. Deliveries took place from the port of Tanjung Priok (Jakarta) 10 April 2019. The Philippines became the first destination country for the export of the All New Honda Brio. PT Honda Prospect Motor’s President Director Takehiro Watanabe said, Honda Brio is a special model because it was developed to meet specific consumer needs in Indonesia and Asia. “Having received extraordinary response from the domestic market, we believe that the All New Honda Brio produced in Indonesia will also be successful in other countries in the Southeast Asia region,” Takehiro Watanabe said. Before exporting Honda Brio, HPM had previously exported the completely built up (CBU) Honda Freed cars to Thailand, Malaysia, Singapore and Brunei Darussalam from 2009 to 2014. HPM also exported Honda cars in components since 1992 to Japan, Thailand, Malaysia. Honda Brio was first introduced in Indonesia in 2012, followed by Honda Brio Satya to support the low cost green car program (LCGC) in 2013. After that, the second generation Honda Brio followed in 2018. Honda Brio is also very well received by customers in Indonesia, with more than 280 thousand sales units to date. In 2019 the latest Honda Brio Satya and RS rank the top sales of the January 2019 period in their respective classes (Honda Brio Satya in the LCGC and Honda Brio RS classes in the city car class). All New Honda Brio Satya recorded sales of 4,798 units and seized a 28 percent market share in the LCGC segment. Meanwhile, the All New Honda Brio RS sold 1,699 units in January and led the City Car market with a market share of 87 percent. If combined, the two models managed to contribute up to 65 percent of Honda’s total car sales in January 2019, which recorded as many as 10,064 units. The All New Honda Brio is produced with international quality standards to meet the needs of consumers in various countries, including Indonesia. 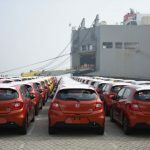 “Therefore, Honda Brio exports from Indonesia to various countries in the Southeast Asia are part of Honda’s commitment to continue to deliver quality products for consumers around the world,” Takehiro said.